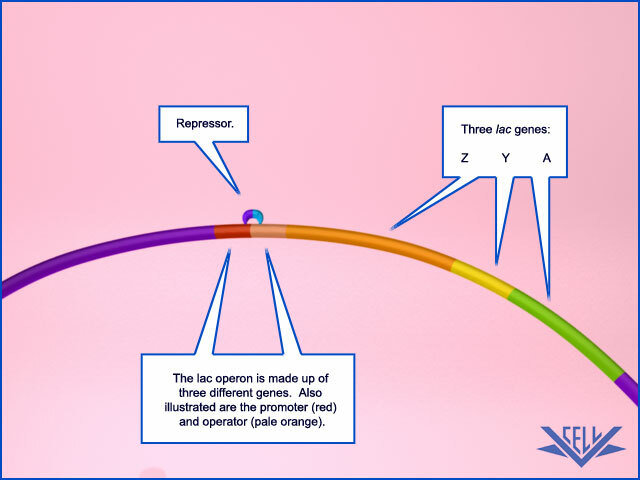 The Lac Operon is an example of an inducible system of gene expression. Its default state is to be inactive. 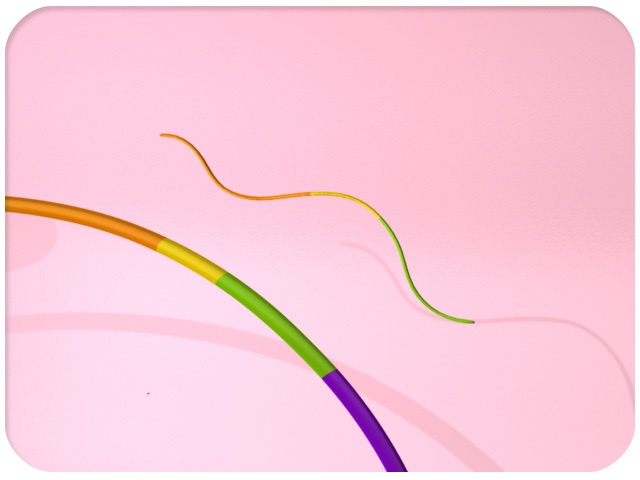 The process is activated when the right catalyst is present, allowing the genes in question to be expressed. The E. coli lac operon is an example of an inducible set of genes. These genes are responsible for the breakdown of lactose into sugars used for cellular metabolism. This inducible system also involves bacterial DNA, a repressor, mRNA, and the sugar molecule lactose. 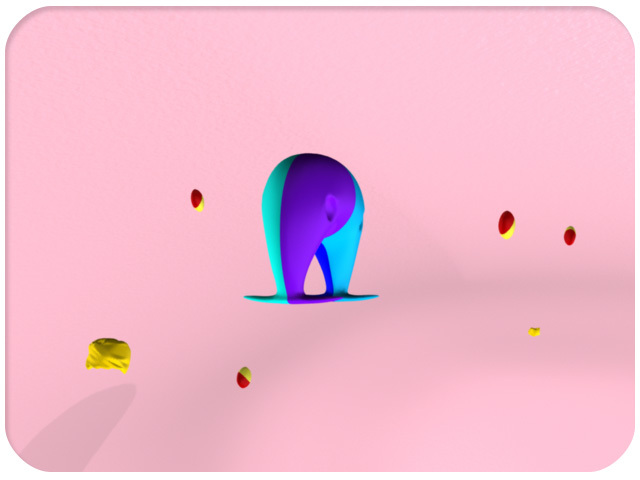 This animation will only focus on two of the three proteins encoded by the lac operon, ß-galactosidase and permease. Gene expression can be induced (or turned on) when a specific inducer molecule appears in a cell. For inducible systems, a repressor molecule prevents gene expression by binding to the upstream controlling region. 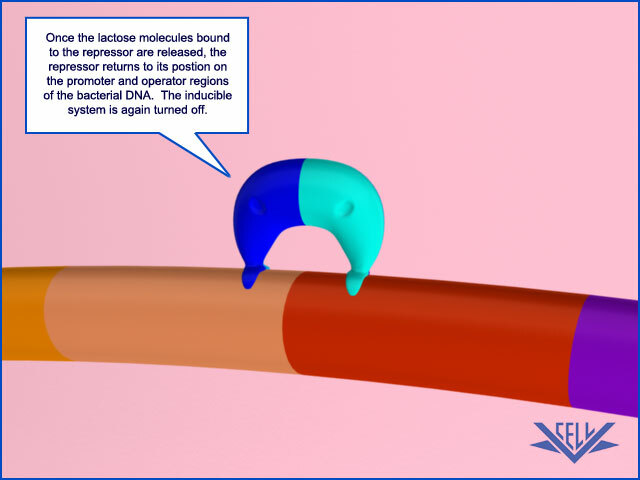 Lactose is the lac operon inducer molecule. After first appearing in the cellular environment, lactose passively enters the E. coli cell and binds to the repressor molecule. 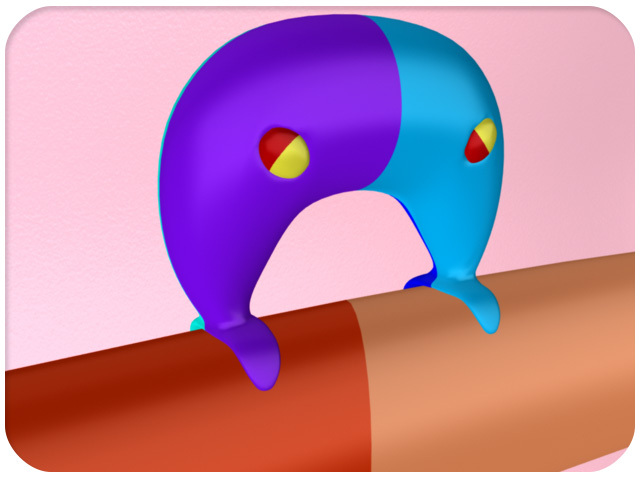 This binding releases the repressor from the controlling region. 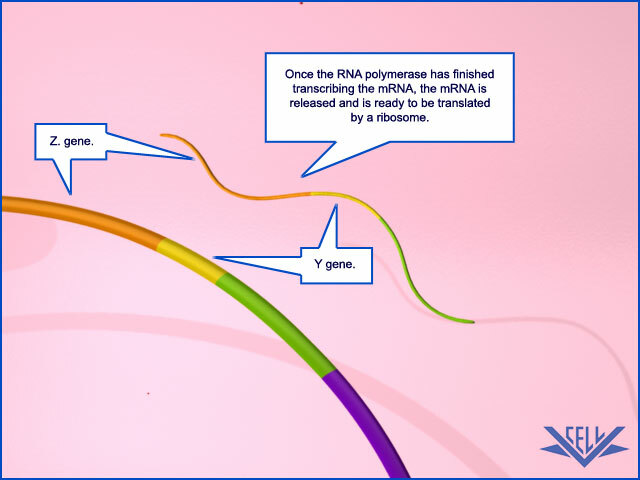 At this point, RNA polymerase can begin transcription of the operon. 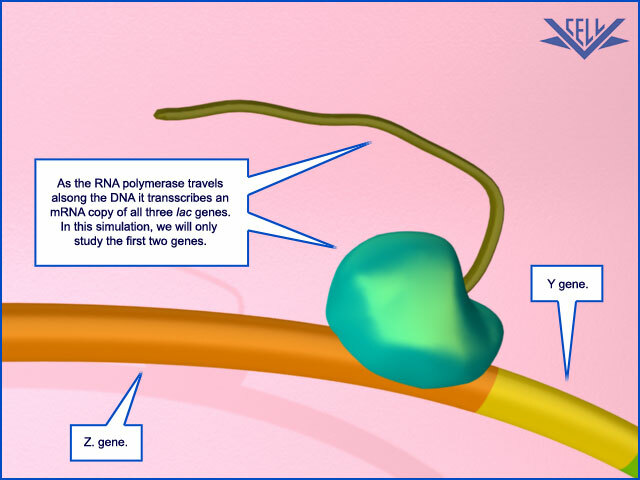 Here we show two of the three lac operon genes being transcribed into mRNA. 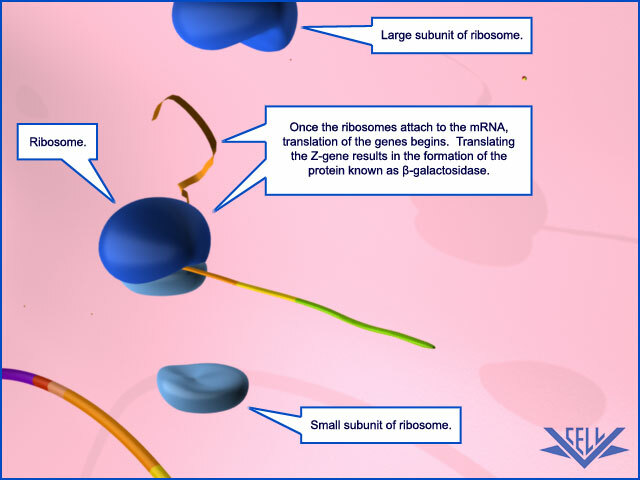 Ribosomes then bind to the mRNA, and the two proteins are translated. 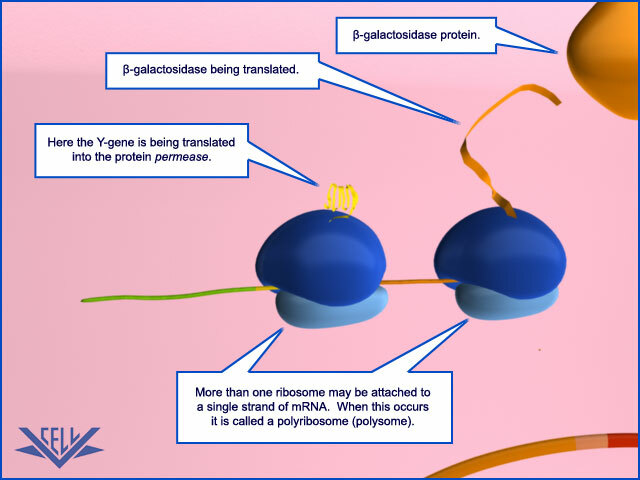 The first protein is ß-galactosidase which breaks down lactose into two simple sugars. 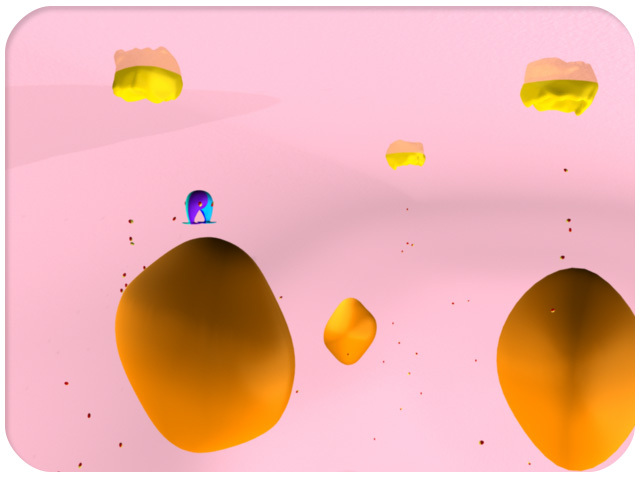 The second protein is permease, a membrane bound protein. 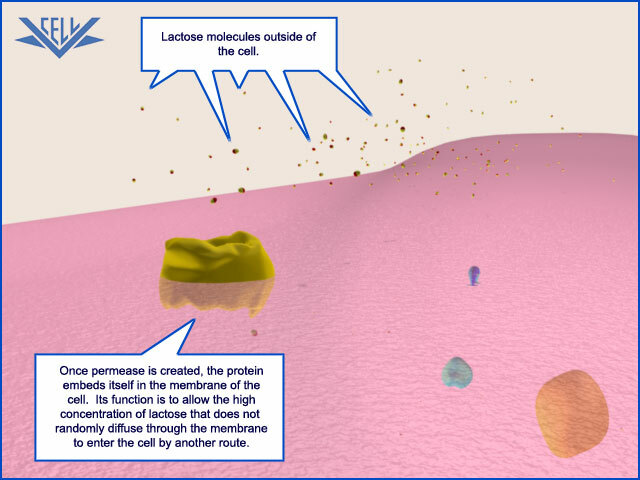 When embedded in the cell membrane, permease functions to provide a direct route for the lactose outside the cell to be imported into the cell. This import occurs at a much greater rate than the passive transfer we first observed. 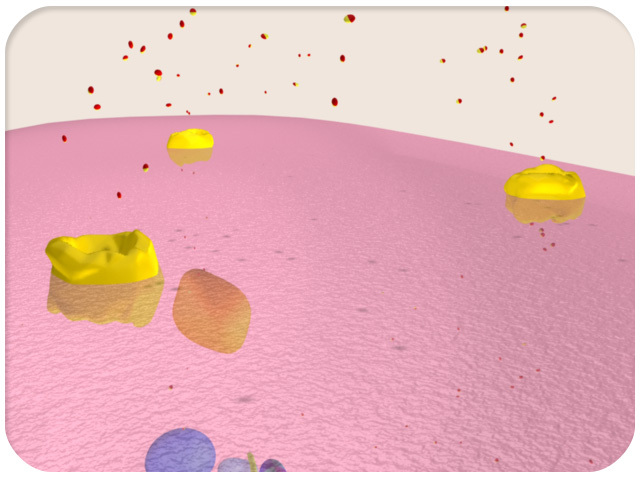 Because translation continues inside the cell, other permease proteins become embedded in the membrane. 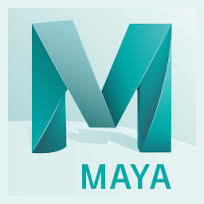 This further increases the rate at which lactose enters the cell. ß-galactosidase breaks the cellular lactose into the simple sugars glucose and galactose. 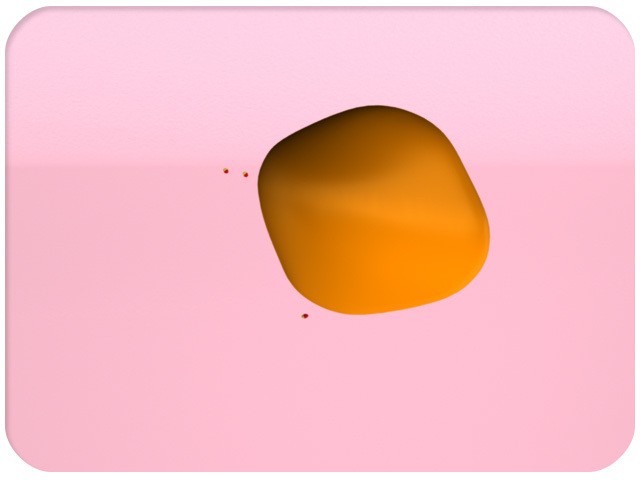 Once its concentration is greatly reduced, the lactose bound to the repressor are released. 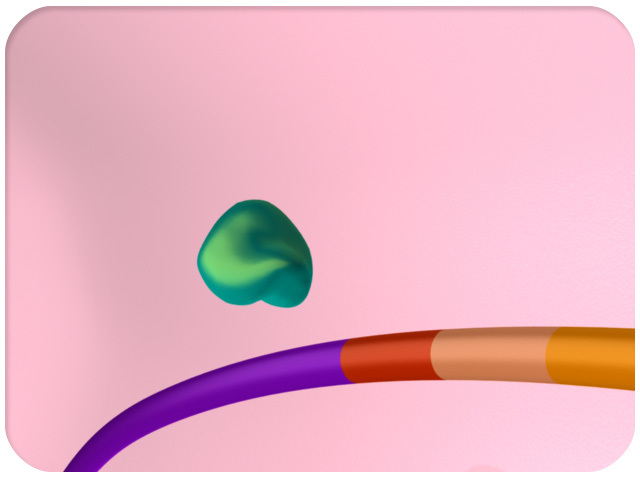 At this point, the repressor again binds to the controlling region and gene expression is halted. For all inducible systems, like the lac operon, it is the interaction of the repressor and inducer molecules that mediate gene expression. 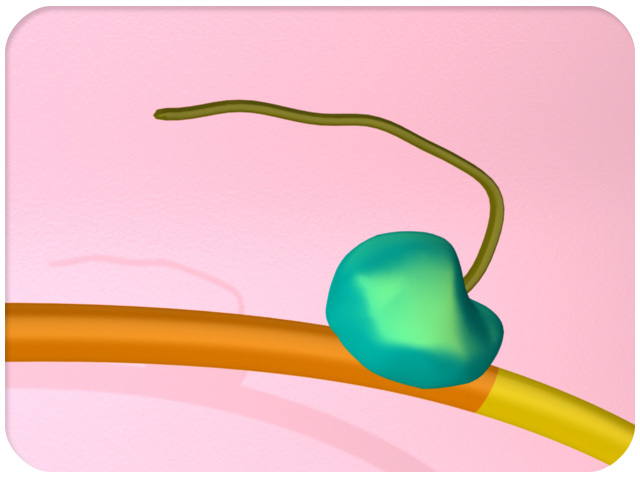 The lac operon functions inside a bacterial cell. 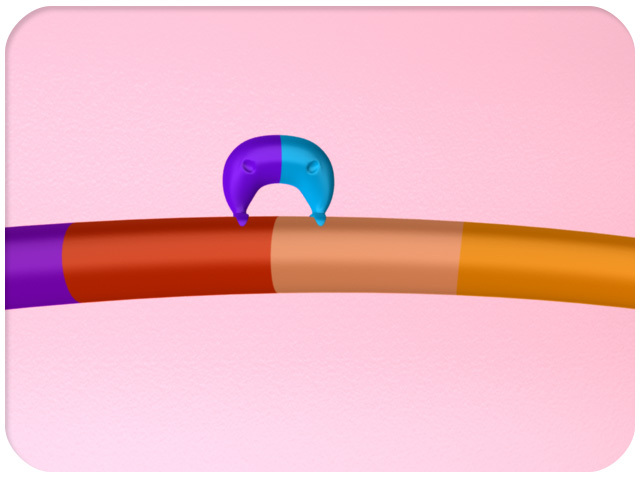 This is a simplified bacterial cell. 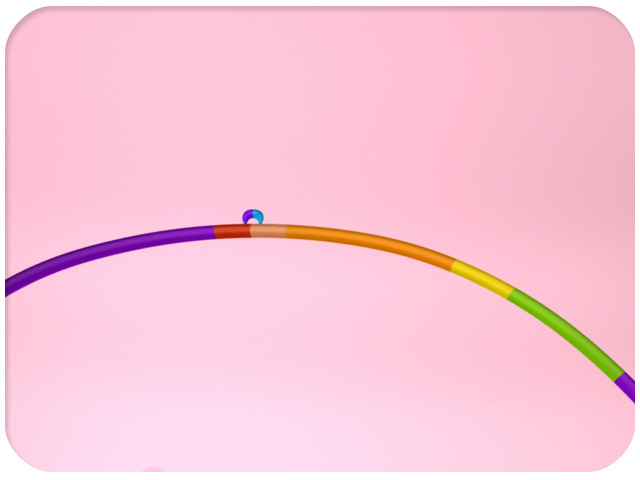 An operon is a series of genes linked together on the bacterial chromosome that are activated by a single promoter and produce a single mRNA molecule. 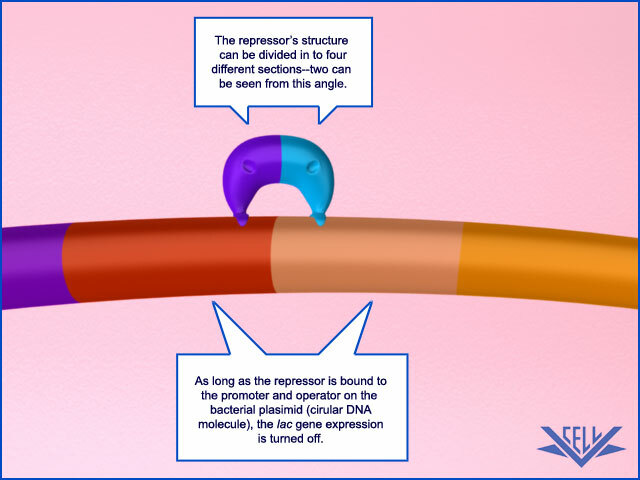 Expression of the genes is turned off when a protein called the repressor binds to the promoter (red) and operator (orange) of the operon. 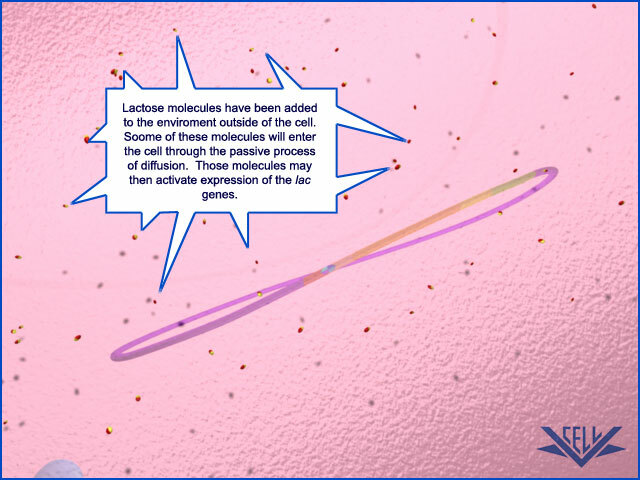 Lactose must be added to to activate the lac operon. 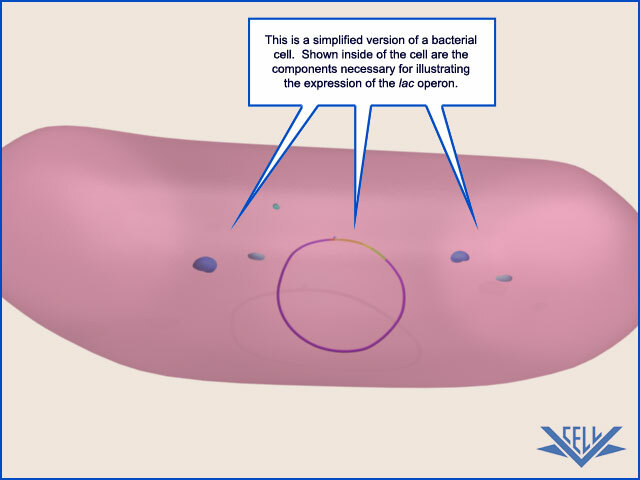 Here it is seen outside of the cellular membrane. 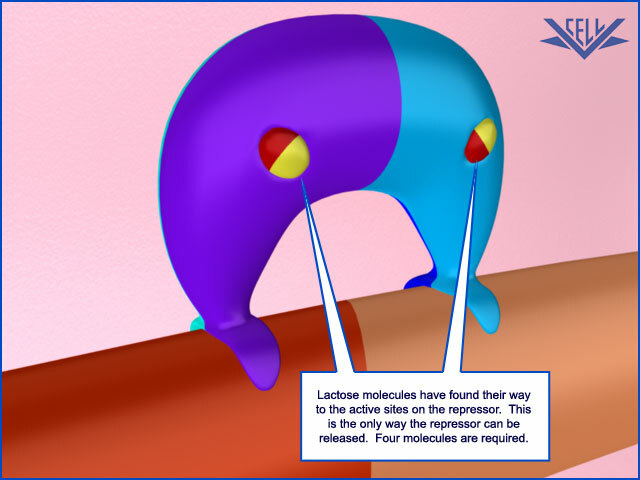 Some of the lactose enters the cell passively and binds to the repressor molecule. 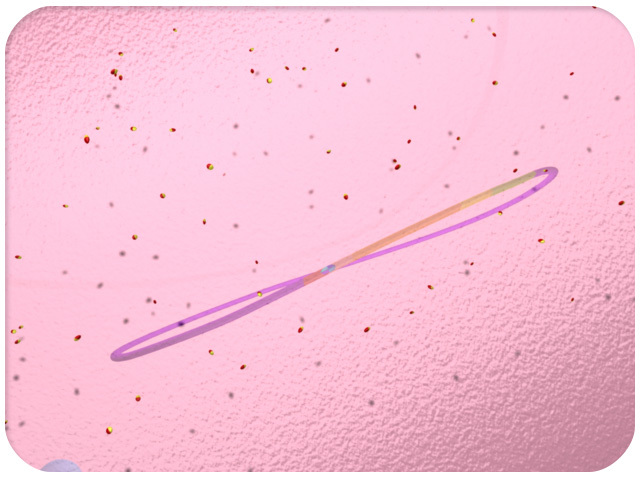 As the quantity of PIP3 molecules rises, they attract a protein called AKT2. 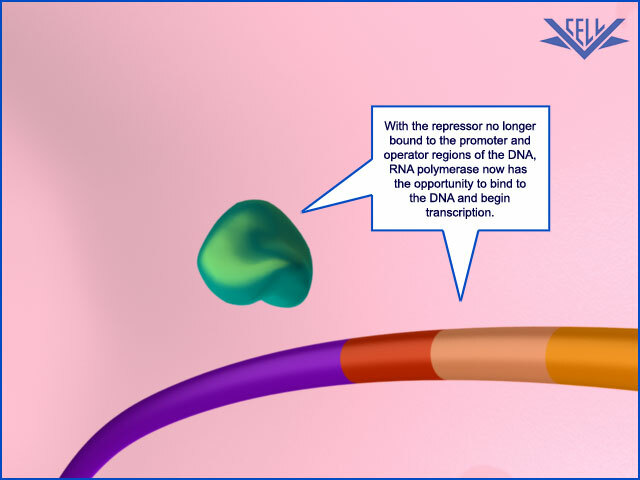 Once the repressor has been released, RNA polymerase can bind to the DNA and begin transcription. 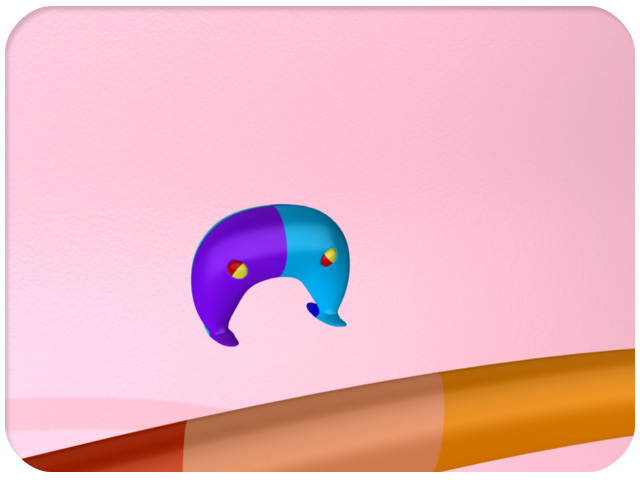 The mRNA that is produced consists of three domains, complementing the genes on the DNA. 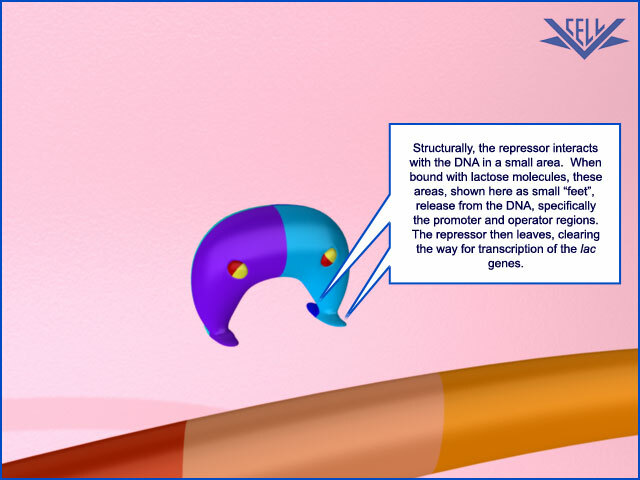 Each of the three domains on the newly made mRNA corresponds to a different protein. Only the role of the first two will be studied here. 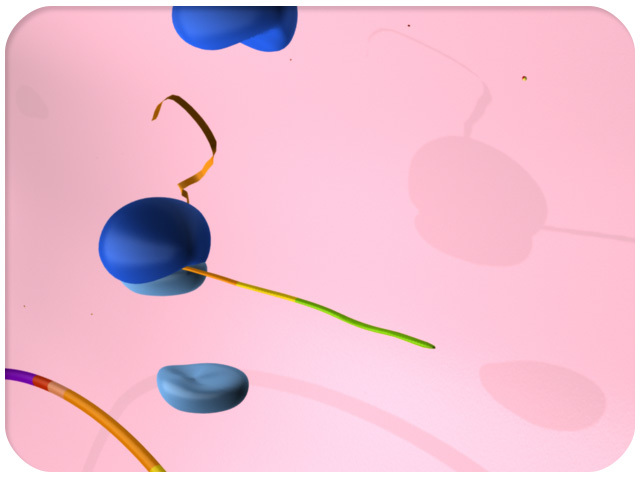 Now the small and large subunits of the ribosomes can bind to the mRNA. Here, translation of the first protein, ß-galactosidase, has begun. 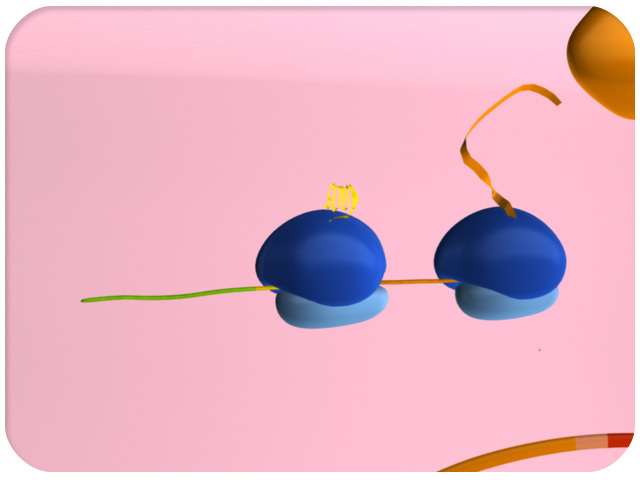 Now both ß-galactosidase (orange) and the second protein, permease (yellow), are being translated. It should be noted that in prokaryotic cells more than one ribosome may be attached to the mRNA at the same time. 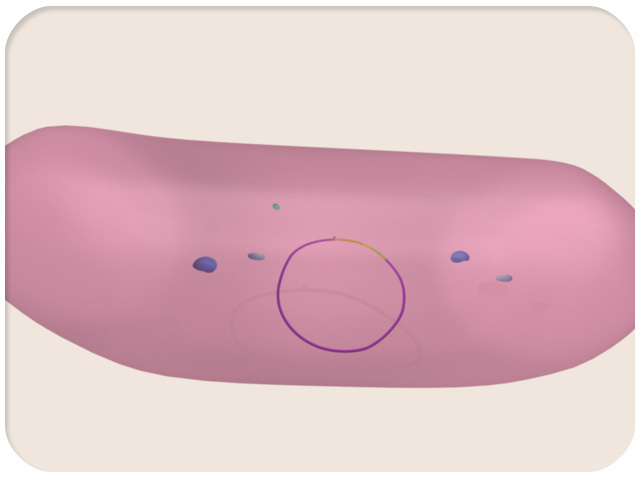 After being successfully translated, permease becomes embedded in the membrane of the cell. 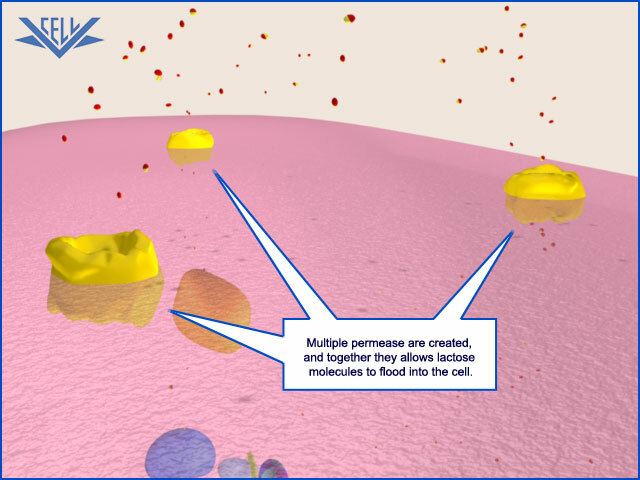 Once the permease has become embedded in the membrane, it allows lactose to flood into the cell at an elevated rate. After entering the cell, the lactose is then broken down by ß-galactosidase into the simple sugars glucose and galactose. 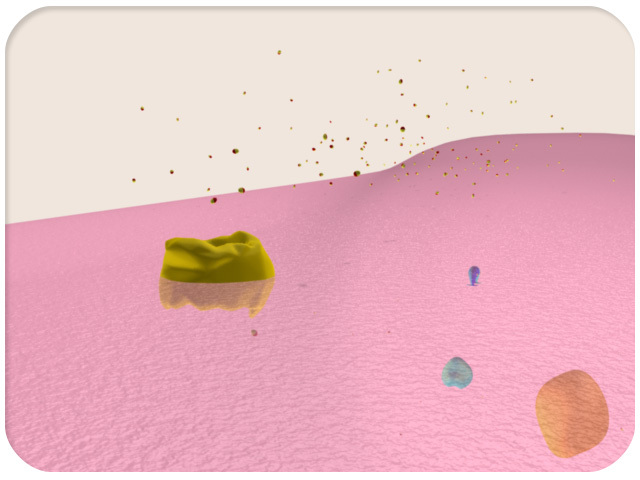 These simple sugars are used by the cell as food. 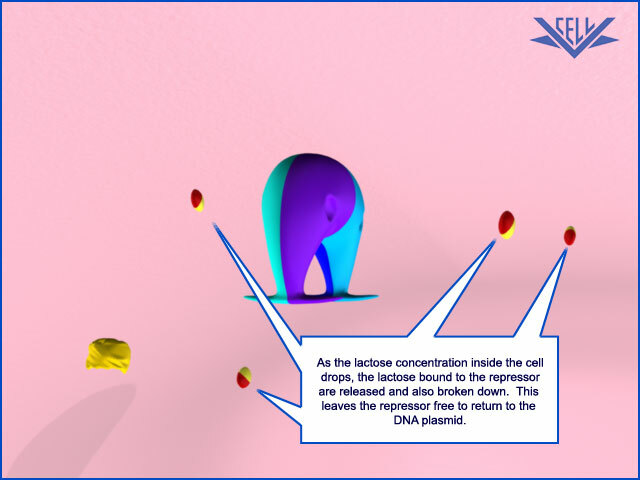 As the concentration of lactose in the cell drops, the lactose bound to the repressor are released. The last of the lactose is then broken down by the ß-galactosidase. Free of the lactose molecules, the repressor again binds to the promoter and operator of the operon and effectively turns off gene expression.